Developments in the business sphere are advancing faster than ever. The world is at a technological peak, and every day is full of incredible innovations and improvements. 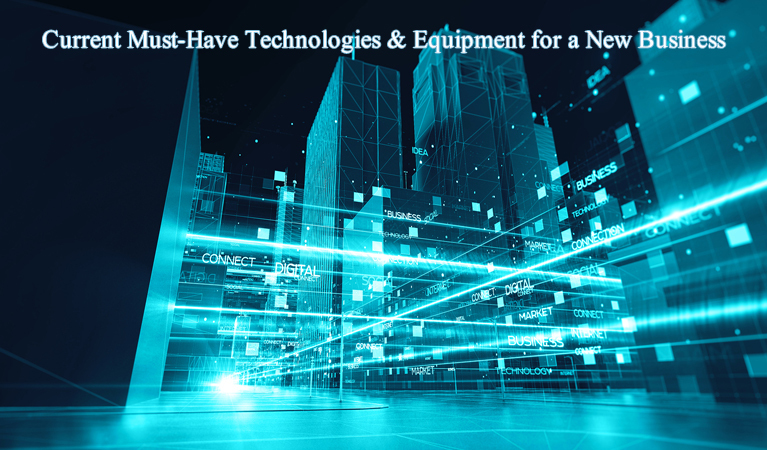 As a budding business owner, you need to be aware of the best and most current investments for technologies and equipment on the market. When it comes to “must-have” items for a startup, some are new and others are well-known business mainstays. Here are a few items to include in your new business toolkit. After you’ve assessed the skills and resources you need to make your endeavor a success, you should have an idea of what computer hardware to invest in. Your computer houses the core infrastructure for your entire IT operation. The desktops or laptops you use at work are the most basic technological needs in your business. Nearly any store-bought modern computer will have the power you need to run a company. Find a server that provides you with the amount of data storage your brand needs. Your server should offer scalable solutions to allow your company to grow and expand. The hardware you need will depend on your area of business. Partner with your local tech guru, IT team, or take to the internet to find out which hardware is right for your enterprise. Keep your business plan, desired platforms, and data needs in mind. Some of the top business desktops of 2017 include the Apple iMac 27-inch, Dell OptiPlex 24 7000 series, and the Dell Precision Tower 3000 series. Once you have your hardware, it’s time to choose your operating system. Windows is the most popular OS on the market, and one you are probably already familiar with. Windows Small Business Server comes with all the basic items you need as a startup, including data-sharing, company intranet, shared calendars, remote access, and data backup/restoration capabilities. There are plenty of other software choices available, including Linux Ubuntu, Solaris, and Mac OS X. Read about each to decide which is right for your needs. The operating system you choose makes a major impact on how you conduct business – so choose wisely. The cloud is a critical component of modern businesses. Cloud computing gives you access to the latest versions of software and applications, the ability to downsize expensive data centers, flexible costs, easy scalability, and secure online data storage. The cloud improves your company’s mobility, collaboration, productivity, and bottom line. You won’t have to purchase equipment for a data center or allocate space in the office for one. You can enjoy peace of mind in your data’s security with a trusted cloud provider, and easily share and store information across platforms. Learn how to choose your cloud provider to make sure you invest in the services you need – no more, no less. Whether you go with old-school desk telephones or prefer giving out company cell phones, you need to create a business phone system. Over the phone communication is still a vital part of any business, despite the growing popularity of online chats, texts, and video calls. Do not overlook your business telephone system. Research the different options and service providers available to you. You may have the opportunity to save money and bundle your phone service with your internet or other provider. Invest in the right size phone system, with the right features, at the right price for your business. QuickBooks. This accounting software provides a full picture of your company’s financial health. Track your business’ sales, expenses, financial statements, profit-and-loss, reports, employee payroll, vendor accounts, and more. QuickBooks works across all interfaces, and is accessible via smartphone. It connects to thousands of accounts, seamlessly uploads financial data, and lets you take snapshots of receipts from your phone. With plans ranging from $13 to $40 per month, QuickBooks has something for every business owner. Fuze. This app lets you video chat in high definition across all devices and operating systems. Fuze is perfect for conducting seamless videoconferences and online meetings across smartphones, tablets, laptops, and desktops. With HD video and crisp, clear audio, Fuze makes video communication easy and rewarding. Furthermore, it is free to download with a simple setup. Customize your service plan for an even better communication experience. Evernote. Evernote lets you capture thoughts, ideas, and information quickly and easily, collecting it onto one comprehensive, ultra-organized platform. Clip articles and save them in just a click, create folders and notes, upload up to 60 megabytes of data per month, and sync your ideas across all platforms and devices with this all-in-one organizational app. You’ll never forget anything again. Apps are your best friends in business. There is an app for virtually anything you can imagine as an entrepreneur, from office fitness and gamification to accounting and back-office management. Many apps offer free trials so you and your staff can play around with a few before deciding which to invest in for the long term. “Cash Only” businesses are giving up countless opportunities to make a sale. Many customers no longer walk around with cash, and are forced to either find an ATM or take their business elsewhere. Take your ability to accept all major debit and credit cards with you by purchasing Square – the most popular way to accept payments on the go. As of February 2016, more than two million sellers used Square for card processing. Square has developed far beyond simple payment processing services, now offering plenty of resources for entrepreneurs such as cash advances and payroll services. It has become a staple for businesses of all types and sizes, helping small business grow and established companies stay ahead of competition. Master social media marketing with Hootsuite – the free and incredibly helpful way to connect with your customers online. Manage all of your social media platforms and marketing campaigns from one simple interface with a user-friendly dashboard, special tools, and scheduling capabilities. Time your social media posts to coincide with the best times of day to post per platform, measure your social returns on investment with real-time analytics, and make your brand stand out on social media. Hootsuite tracks messages and mentions, protects your profiles, and guards against hackers. With a variety of business plans available, you’re sure to find something that matches your needs and budget. This small, fast, and affordable charger can save you lots of stress by keeping your mobile devices powered no matter where you are. The Anker PowerCore 10,000 portable battery charger with quick charge boosts your battery to 100% in less than 30 minutes without the need for an outlet. It can charge nearly any device using USB, and holds enough power to fully recharge a Samsung Galaxy S7 more than three times. At just $21, this charger is a steal and a must-have for the modern businessperson. Take it with you to on-site client meetings, important conferences, far-away events and conventions, and enjoy battery power peace of mind. Start your new business off on the right foot with the top technologies, hardware, and software of today. The modern entrepreneur needs to stay tech-savvy and up to date on the latest best practices and investments. With these items in your toolkit, you’re well on your way to startup success.